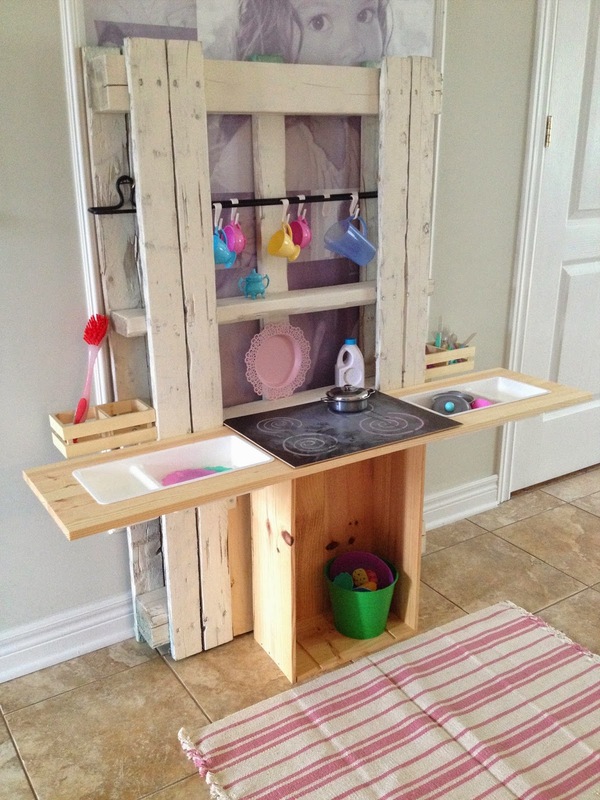 Ava's new kitchen- build an easy kid's kitchen this summer for $30! The kitchen is not 100% done but it's definitely getting some use already. It started with a wood pallet. If you don't have one, that's fine- it's not necessary. The back structure could be built with 2X4's and 4X4's. Kids love playing with water, so I really wanted to make her something like this after seeing a few examples on Pinterest. I saw nothing like this though. I just wanted to use what I had and a few store bought items, so feel free to customize yours as you wish! The possibilities are endless and there are no wrong ways of doing this. It's so easy! Just make sure it is secure and sturdy so it doesn't crush the cutie you made it for! It's awesome because it's protected with Thompson's Water Seal so it can be left outside for play! And, we can fill the sinks with water. Ava has been incessantly wiping the counters and stove top. Just like her mommy. I went to Ikea, obviously, and bought the Ekby Stilig shelf for 10$. It is 17X11 so it's a nice size. I also bought 2 of these storage organizers that work perfect as little sinks. 1$ each. You need a jigsaw to cut the holes. Mark with a pencil where you want them and simply saw away. I've used many power tools before but this one intimidated me a little, so I asked Greg for help. Some other cute accessories from Ikea included these drawer handles and green storage containers. 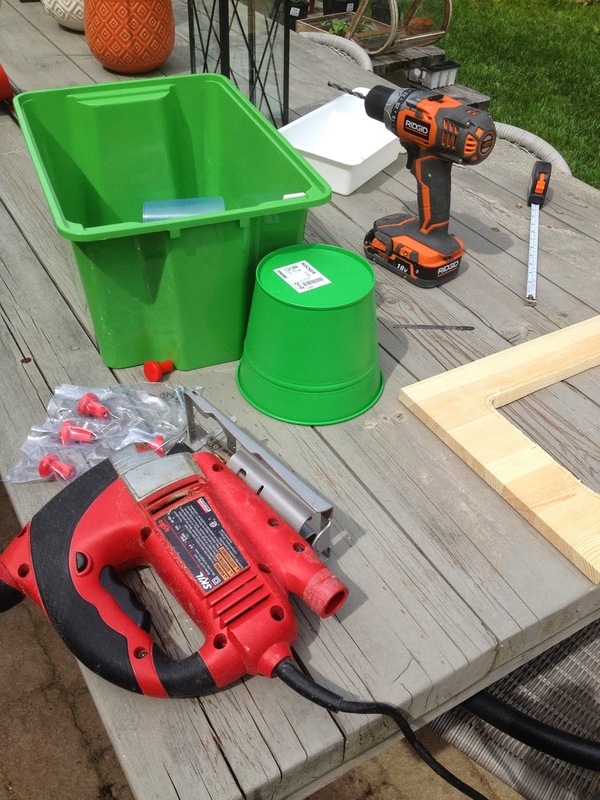 I am planning on drilling the knobs into the shelf to mimic stove knobs (which will turn). This was the pallet before. I did give it a quick coat of Rustoleum in antique white and Thompson's water seal. And this is the progress. 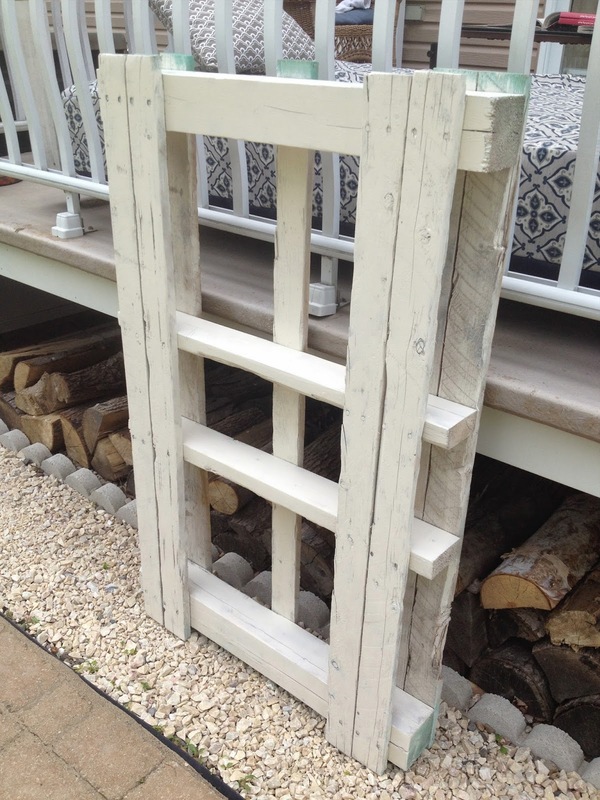 We attached the shelf to the pallet using plain old shelf brackets (Ekby Stodis) 1$ each (used 2). I slid a wine crate underneath for extra support and storage. Maybe I'll turn it into an oven? The black rod iron rail is from ikea but they don't sell it anymore. However, they do have one called Bygel and it is only $3! The white hooks are from Ikea $1. 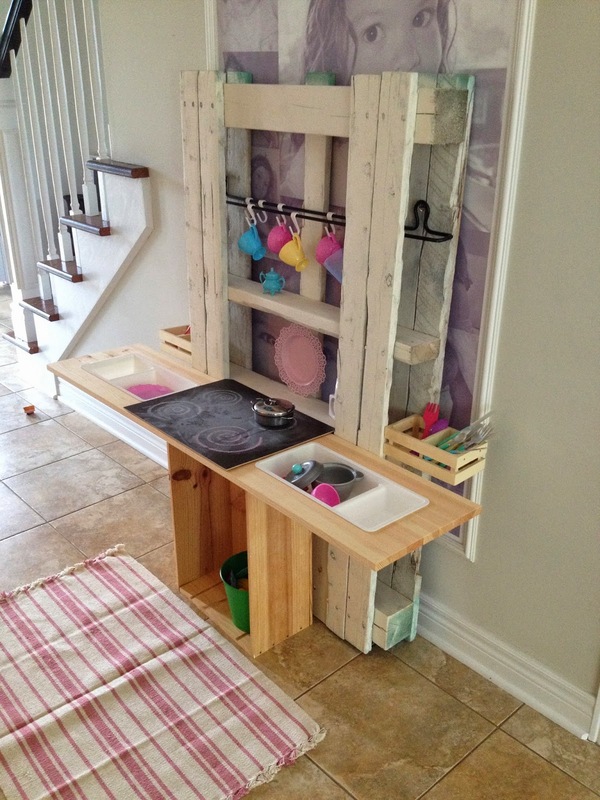 The cute little wooden storage bins on either side of the kitchen were from Dollarama. I used the backing of a 2007 Ikea Ribba frame for the stovetop. It's the same texture as chalkboard so I didn't even have to paint it! Total fluke! Not sure if the new ones are made that way. You don't need chalkboard though. You can glue felt rounded pads or whatever you think of to the shelf! And of course having 3 girls, we already had a lot of kitchen accessories. Total $30. Everything thing else I had on hand. I'm trying to integrate some sort of hand soap pump but filled with water (to mimic a faucet). I'll keep you posted with any other ideas I think of for this (and any other progress!) I'm sure this will entertain my 2 youngest for hours, so I hope!